There is no question about it that Stranger Things is one of our favorite shows to binge-watch, but what happens when two of our favorite dancers create one epic, dance video in tribute to the hit show? You get an absolute masterpiece! 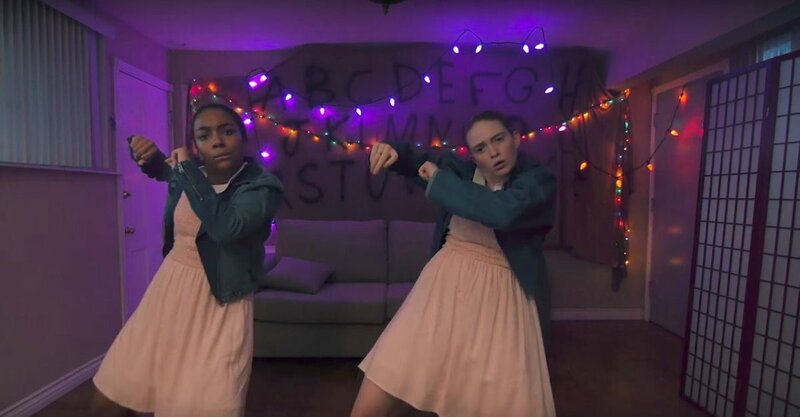 Prepare to be #shook as dancing sensations Larsen Thompson and Charlize Glass just recently released a spectacular, dance video for Stranger Things. In the amazing video, the two, immensely talented and stupendous, young ladies channel in their inner “Eleven” and show their out of this world, mind-blowing dance skills. We seriously can watch this video over and over again. Charlize Glass shared the fantastic still from the video as seen below on her Instagram account. We’re at a loss of words with just how phenomenal Larsen Thompson and Charlize Glass’ Stranger Things tribute video is. The choreography by Mollee Gray and Jeka Jane is outstanding and these two dancing queens totally took it on with such excellence. There is no question as to why the video has and continues to go viral on all social media platforms. Be sure to watch Larsen Thompson and Charlize Glass slay it in their Stranger Things dance video below. Previous VIPAccessEXCLUSIVE: Kira Kosarin And Audrey Whitby Interview With Alexisjoyvipaccess At “The Thundermans” 100th Episode Party! Next Article: It’s Time To “Rock Your Hot Mess” With Brooke Lewis And Alison Cohen’s Fantastic, Trucker Hat – Get Yours Today!